Vancouver has been hit by two storms this week, with another on the way today. So far we’ve lost power three or four times, beginning with Thursday night. Friday it went out a few times, but luckily came on shortly after coming home from work. I don’t really mind the power outage, however I still haven’t learned how to open our garage door manually when the powers out (oops), so I always count on Adam to get my car out in a power outage. The last of the storm is supposed to hit today with high winds and even more rain. The cold, blustery weather makes you want to curl up with a blanket and a good book with pumpkin-scented candles. I realized the other day, while searching for said candles, that I’m in need of a visit to bath and body works to get some more candles (much to Adam’s dismay.) His theory on candles is that you’re literally burning money – ha. ha. Secretly I think he likes them – especially the pine tree scented ones! Weekends are meant for pancakes, and cuddling under blankets. My favourite way to make pancakes is in the blender – I can’t remember the last time I used a whisk or hand held blender. 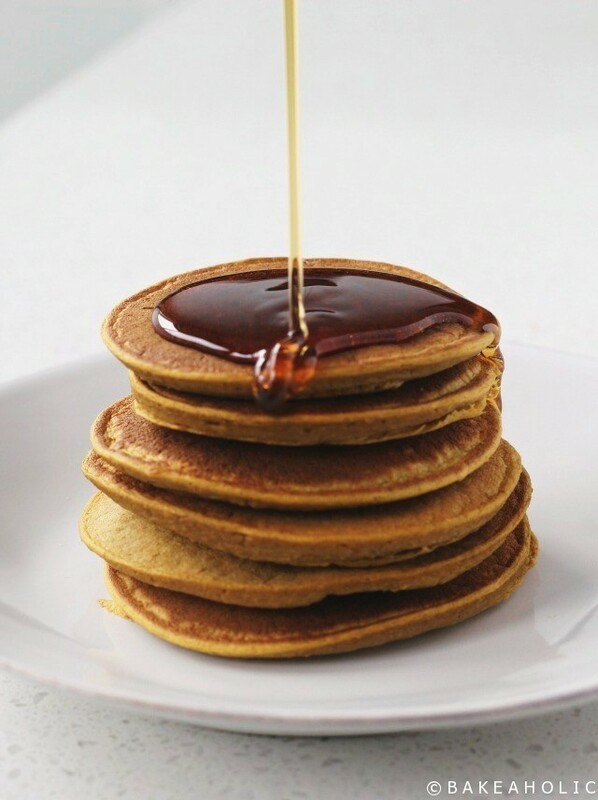 The high powered blender makes the batter silky smooth, and airy so the pancakes rise perfectly. Plus, you only dirty one appliance. Simply blend together, and pour. I use a griddle to make them as well, after my mother-in-law bought us one for a wedding shower gift last year when she realized we didn’t have one. I was so excited to use it! It’s the best thing to ever happen to pancakes. 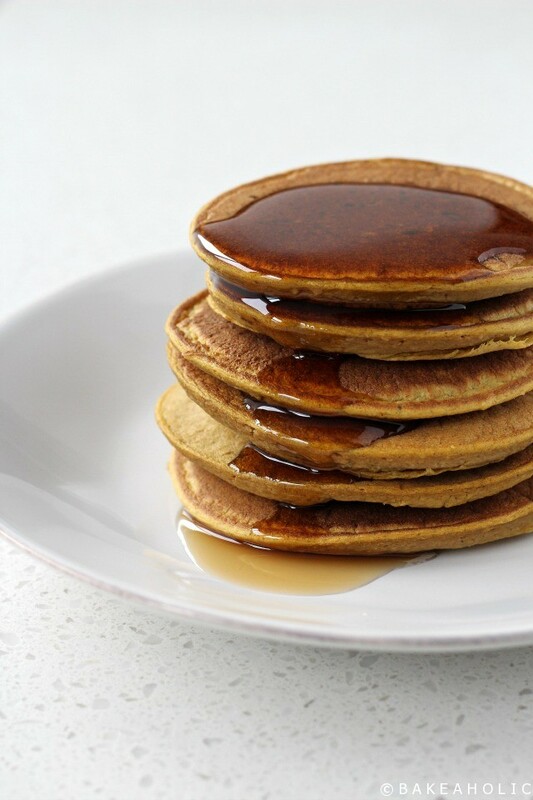 You can make pancakes for a crowd, quickly and easily. I hope you’re all taking cover this weekend and staying warm and dry. I suggest you make these pancakes before the power goes back out, again. 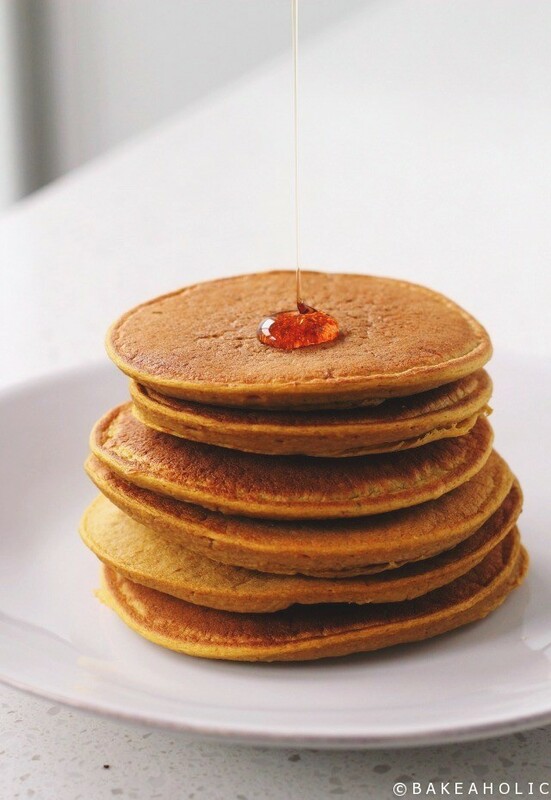 Dairy & Gluten-Free, these Blender Pancakes are easy to make and perfectly spiced for a warm fall breakfast. To make the oat flour, in a high powered blender (or food processor), pulse the oats for 1-2 minutes until fine flour forms. Add in the banana, pumpkin puree, non-dairy milk, eggs, spice, baking soda and baking powder. Blend on low, and increase speed until well blended - batter should be airy. Pre-heat your griddle as per the instructions, or prepared pan over medium-high heat. Pour batter and cook for 2-3 minutes each side - flipping once you see the 'air bubbles' surface. Leftovers can be refrigerated for 2 days. Thanks Earth’s Own for sending me So Fresh Almond Milk!